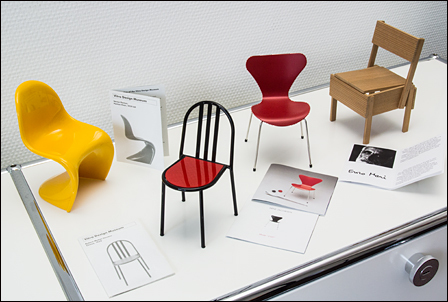 In the years from 1992 to date, the Vitra Design Museum has launched 130 different miniatures. Each miniature is accompanied by a booklet. This informs on the designer’s biography, the model name, the dimensions, and the materials the miniature is composed of. Other manufacturers also enclose booklets or leaflets presenting interesting details with their miniatures. On the picture above, I exhibit among other things the highly elaborate 16 pages booklet by 1:6 Design, located in Naerum / Denmark, and a simple but very detailed leaflet on the miniature Sedia 1123P by Enzo Mari, produced by the Italian designer Sandro Catani. 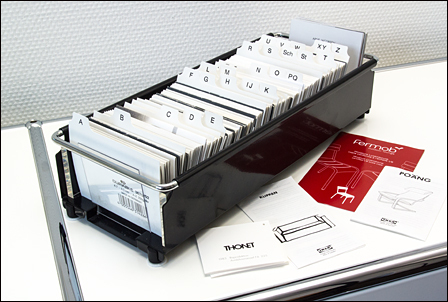 The picture below shows further leaflets of the Ikea Poäng chair and the Klippan sofa, a small label by Thonet informing in a few words on the desk chair No. 81 (the later armchair No. 225), as well as a leaflet of the miniature of the outdoor chair Luxembourg by Fermob. As I frequently take a look at the leaflets, I removed them from the wood and cardboard boxes and stored them in a separate filing box. The classification follows the designer name and the model name and has proven to be functional as it saves myself time-consuming searching.